Some of us were chatting about breathalysers. A few of the car companies that invite journalists to drive their latest model ask us to take a breathalyser test before they let us set off. Tom Scanlan safely has a few in the name of drink-driving and road safety. So why don’t we all get our own kits and test ourselves? The statistics issued by the government about drink-driving are very revealing. The fairly good news is that overall over the last decade, we, as a nation of car drivers, have improved slightly. Take one set of statistics: ‘Breath tests and breath test failures by drivers involved in reported accidents’ — in 2007, there were 255,891 accidents, at which 185,307 breath tests (57%) were carried out; 3.9% of these were failures or 2.2% of all accidents. In 2016, accidents had dropped rather dramatically down to 146,024, with 89,202 (48%) breath tests; 3.8% were failures or 1.8% of all accidents. Is the message, don’t drink and drive, getting through? Maybe…in 2006, by age, of drivers killed, 25% were aged 16-19. In 2015, the figure was far better, but still horrific, at 10%. Perhaps the youngest drivers really are taking care. Other age groups have also improved: 20-29 from 36% to 28%, 30-39 from 31% to 22% and 40+ from 17% to 10%. There are plenty of breathalysers on the market. It seems like a good idea, first of all of course never to drink and drive, but in any case, it would be good to learn how you are affected by alcohol from the point-of-view of the legal limit. Especially in the Christmas Party season with the possibility of even being over the limit the following day. I’ve been doing just this with what is one of the most sophisticated types of breathalyser on the market you can buy. 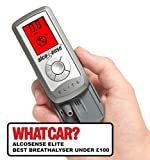 It’s the AlcoSense Pro at £149.99, it had better be good! It is very easy to use and feels very well made. The Alsosense Excel was also tested and is a good choice. I suppose that my idea was that I could go to the pub, have a pint and then blow into the device to see if I was below the limit. Well, up to a point, that could be what you could do. But the important thing, if you must drink alcohol, is to read the instructions and learn that, for a proper reading, you should wait at least twenty minutes (or thirty minutes as it says on the AlcoSense itself) before testing yourself. So you switch the Alcosense on by sliding it open, attach your blow-tube and blow. There is a very simple display that you follow to carry out the test properly and it takes just five seconds. Depending on how your body has dealt with any alcohol, the reading will be displayed in red if you are over the limit with your exact ‘score’ being shown; an amber display gives your score and a warning not to drive. These will also estimate, because we are all differently-sized, etc., how long it will take for your body to eradicate or metabolise all alcohol (‘sober’) which could well be several hours. Finally, a green display will reveal that you are ‘low’; this could be that you are less than 20% of the blood/alcohol limit or zero. You can set a timer to alert you to when you might be ‘sober’ or for sooner or later. Overall, then, a breathalyser is a must for any driver who is even only an occasional drinker. The AlcoSense Pro is top of the market. Right now, I wouldn’t be without it. 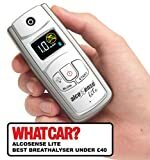 AlcoSense have both more and less-sophisticated breathalyser models in their range. Prices range from £59.99 to £249.99. Please drive safely this Christmas!